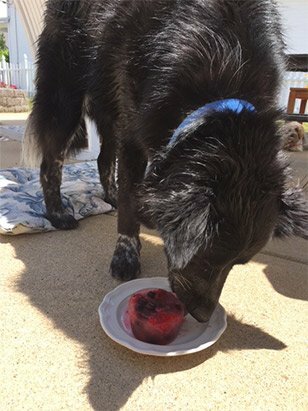 It is important to make sure your dog is safe when running during the hot summer months. Here are some tips to keep him safe and healthy! Make sure your dog is conditioned to run in warm, humid weather for the distance you are going. Always check that the road is cool enough for your dogs paws. Place your hand or bare feet on the road, if it is uncomfortable to hold them there for more than 30 seconds, then it is too hot for your dog to run on. Run early in the morning and towards evening when the weather begins to cool. Always watch your dog for signs of heat exhaustion: slowing down/lagging behind, excessive panting, tongue hanging out. If they seem to be having trouble, bring them to a cool area and call a veterinarian. Bring plenty of water for you AND your pet! Photo on the right Oz after an 11 mile run. He got a cool spray down with the hose and a frozen healthy treat. Just mix water, blueberries, and raspberries in a small Tupperware or ice cube tray, and freeze!